During BEA, I could not stop talking about this book. Everyone seems to be on a steampunk kick, including me. But this one is a bit different. Let me explain: First of all, it's Victoriana, Steampunk, Sci-fi, and it includes, and don't faint, extremely hot zombies. Yep, I said it, hot zombies. Oh, more surprises? it takes place in the year 2195! Abraham Griswold "Bram" is a punk miner on the outskirts of the very Victorian New London, which just so happens to be in South America because the rest of the world has died off. Bram and his best friend Jack are killed within the opening moments of the book; attacked by unknown forces that are really not explained. Nora Dearly, is your proper Victorian young lady. Her dresses are the right length, her parasol is perfect, her boots laced up nice and tight. Yet, she can wield a digidiary and cell phone like the best of them. 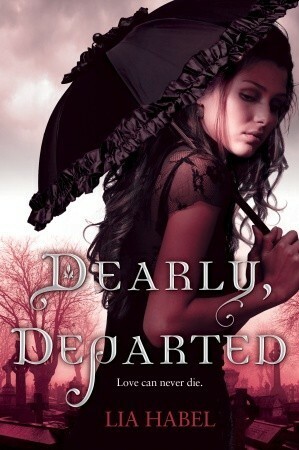 Yet, Miss Dearly is an orphan living with an aunt who has lost all their money. It's been one year since her father's passing and she is coming home for the Christmas Festivities. However, her stay with her aunt is short-lived. She is attacked by zombies trying to kill her and wanted by zombies who need to protect her. Pamela Roe is a girl of no station and is Nora's best friend. She seems more like a handmaiden to the lovely Miss Dearly, but they love each other equally. So when Nora goes missing, she does what she can to find out who took her and why. Pamma is one of those strong characters that I can really get behind. Her family may not be rich, and her brother might be annoying, but she loves them and Nora and would do anything to protect them. Even if it means crossing paths with zombies. Nora's life is turned around in a matter of seconds when a group of Z Company zombies take her to their camp and inform her that her father is not dead, but undead and has gone missing when he found out his daughter's life is danger. Bram is the one person that seems to get Nora's attention and even though he is undead, he helps her understand what is going on and why they are what they are. The language that Lia Habel uses made me feel like I really was in 1800's London, not some society three hundred years in the future. Nora's choice of words endear her to the members of Z Company, and not just because her dad is what created them. A Laz virus infected some people and when they were bit, they died and if you came back to life right away, you still kept all your facilities. Dr. Dearly created a way to keep their bodies mobile and supple so they weren't just losing limbs or various other bodily necessities. Complications arise when Nora and Bram start to fall for each other. A human and zombie? That is just not done. But there is humanity within Bram, and because he died so young (16), he still wants to experience things like love and devotion. Especially when he was so cruelly turned out by his family who now think of him as a monster. While Pam is doing everything in her power to find Nora, she is burdened with the task of realizing that Zombies took Nora and she may not be alive. Bram's CO will not allow Nora to call anyone. It saddened me that a wannabe suitor of Pam's, Michael Allister, was in fact using her to get closer to Nora Dearly. I really want to see Pam happy. I was pleasantly surprised by this book and I'm glad that I finally took the time to read it. The only drawback is that their are quite a few POVs in the book and getting into other people's heads can take you out of the story at times. It's a minor detail but it might annoy some readers. However, I definitely think if you like zombies, steampunk, sci-fi and Victoriana, this book is for you. Lia Habel is a young voice that I am definitely looking forward to reading more of.